My toddler has never shown much interest in crafting, but when I asked him if he would like to help me make a snowman, he gave a resounding “YEAH!” I was thrilled at this improvement – and even though his attention span waned before we reached the end, I have hope for many more craft projects this holiday season! 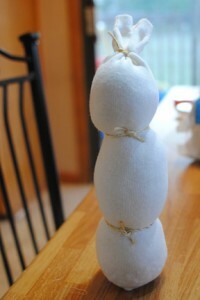 This simple snowman can be easily made with supplies you probably have lying around your house. My original intention was to make it from an old sock with a missing mate, but I couldn’t find a white one. I ended up using a plain white baby size legwarmer. Either way works great! 1. 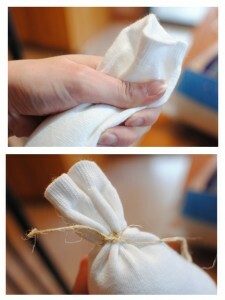 Pour 1/2 cup of beans into the bottom of the sock. 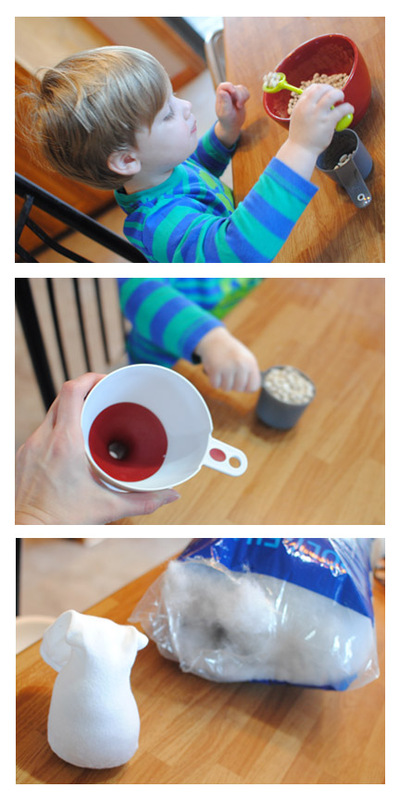 Since I had a toddler’s help, we used a funnel. 2. Use Polyfill or other stuffing to fill the rest of the sock. Leave about 1-2″ empty at the top. 3. Use twine or yarn to tie off the top. 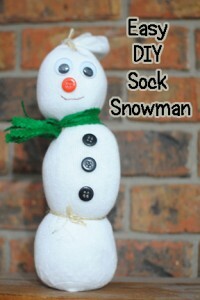 Divide the snowman into three sections by tying twine or yarn to make very tight knots in two places on the snowman’s body. 4. Embellish as desired. I cut a piece of felt with pinking shears to make the scarf, then used buttons for his eyes, nose, and tummy. I attached the buttons with hot glue. I hand-stitched his mouth with red thread. 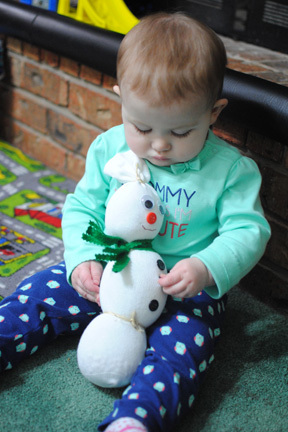 If you have an infant who will want to play with the finished product, sewing the buttons on would likely be a better choice! Our snowman lives out of reach unless there is an adult nearby to supervise. There you have it! A quick, easy and cute little snowman – perfect for holiday decorating or gifting! Julie is a babywearing, breastfeeding, cloth diapering mama of a 3-year-old son and 1-year-old daughter. In between snuggles and diaper changes, she writes at Director Jewels about sleep deprivation, craft and sewing projects, and how to entertain toddlers.